On Palm Sunday: Hey Jesus, won’t you fight for me? 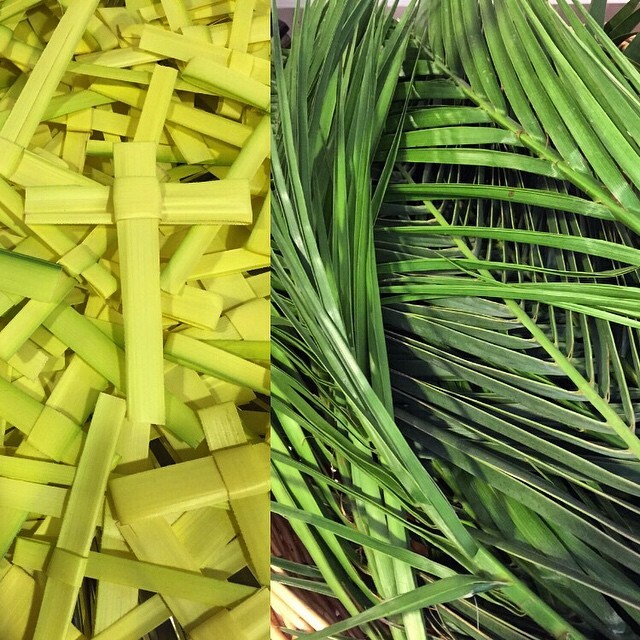 Whenever I think of Palm Sunday, I immediately begin to sing ‘Hosanna’ from Jesus Christ Superstar. It is a super catchy earworm. My guess is you’re singing it right now (and I do sincerely apologize!). It made me question what was expected of Jesus then, and more fully, what we expect of God today. It was expected that the Messiah was going to be a warrior and military leader. Foes and oppressors would be conquered through might and power. The palm fronds were symbols of victory and triumph. The crowd waved the palms in honor of Jesus and in anticipation of his triumphant movement. Thus I imagine it was quite scandalous and a great disappointment when Jesus did not prove to be what they expected. It is no wonder the mob turned on Jesus and demanded his crucifixion. We humans are fickle creatures. And we remind ourselves of that every Sunday during the Sanctus. These words from the Liturgy of the Palms echo every Sunday: Blessed is he who comes in the name of the Lord! I used to cross myself at these words. And then someone asked me why I did that. I honestly did not have a legitimate answer. Probably because I saw a priest do it? I really was not sure, so I quit making the sign of the cross during the Sanctus. And I also began a search to figure out why people practiced this habit at these words. When we sing or say these words, we recall and evoke the events of Holy Week. These words remind us that the crowd that adored and celebrated Jesus on Palm Sunday is the same crowd that called for his crucifixion on Good Friday. When we make the sign of the cross, we are acknowledging that we join with the choir of angelic hosts one minute and become an angry mob the next. We worship God and love our neighbor one day, and then the next day we behave horribly toward our neighbor and turn our back on God. We are fickle creatures indeed. In a way the liturgy becomes a calling, or even a challenge. Which crowd will we join? Will we choose to soar with the angels? Will we choose light, grace, and love? And through the struggle, as we wrestle with each situation and scenario, God loves us. Whether we choose to be awful or an outpouring of grace, God loves us wholly and deeply. God also challenges us to live into the fullness of who we are made to be. The palm cross is a symbol and reminder of that challenge. I love watching people scramble to grab a palm cross or five. They leave the church pinned on lapels and dresses, and they later end up stuffed in Bibles and BCPs, displayed on dashboards, desks, and bulletin boards. My kiddos have always loved to gather and collect palm crosses on Palm Sunday. I have found them in all sorts of unexpected places over the years. Palm crosses are an outward and visible sign of the triumph of sacrifice and love. We take a sign of military victory and fold it into a sign of ultimate sacrifice and love. The challenge of the palm cross asks: will our triumph be love? In a way, Jesus did fight for us. Just not in the way that was expected. Through the victory of love and sacrifice through a posture of humility, Jesus provokes us to acts of love and good works. It is love that breaks through to transform lives and change the world. Will we choose to live as light, grace, and love? By participating and engaging in worship, God will help us to grasp and live into our potential for love and grace. Palm Sunday is a day that challenges our tendencies to go rogue and turn our back on God. Those palm crosses, sometimes hidden throughout our homes and lives, are reminders to choose love. Indeed, love is the final fight. When have you followed a crowd? When have you chosen love? When have you provoked others to love?